Accelerator Day One: how wrong were we? 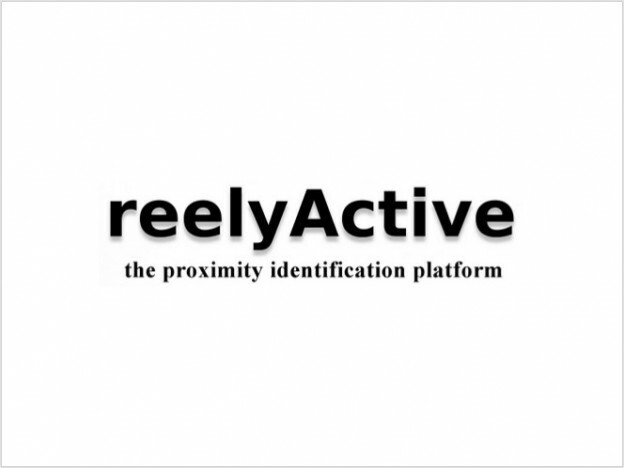 Two weeks ago, we celebrated threelyActive, the three-year anniversary of reelyActive’s incorporation. At that time, the motivation for our incorporation was our acceptance into FounderFuel, one of Canada’s premier startup accelerators. Today is the third anniversary of FounderFuel Day One. On August 13th, 2012 we met the seven other startups of our cohort at Notman House (pre-renovations) and in the afternoon gave our first formal five-minute pitch. Today, to celebrate, let’s revisit that pitch deck, have a good laugh, and see just how wrong we were about our vision, our business and the future. While we clearly recall wrapping up, with immense pride and satisfaction, a day-long discussion among co-founders having arrived at the title “Proximity Identification Platform”, I don’t think too many people, ourselves included, would today argue that we should have stuck with that. Indeed, today we’re about “Smart Spaces”, which, among other things, supports a far more elegant shortened domain name: smartspac.es. We were definitely wrong on the branding: people get “Smart Spaces”. Many will go so far as to add the term to their vocabulary. No such luck with “Proximity Identification Platform”. Nonetheless, we weren’t all that wrong on the concept: Smart Spaces are simply a platform for identifying people, places and things at a human level of proximity. 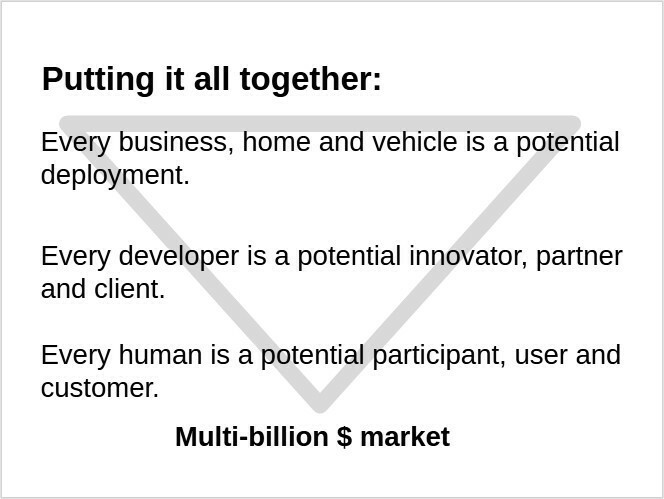 When this is your bold intro slide, it’s quite obvious that what follows will be a vision pitch. You are indeed correct if you identified this as Michelangelo’s Creation of Adam drawn as stick figures on a whiteboard, photographed and imported into the presentation. We stopped using this slide long ago when we focused on what are we doing and why. 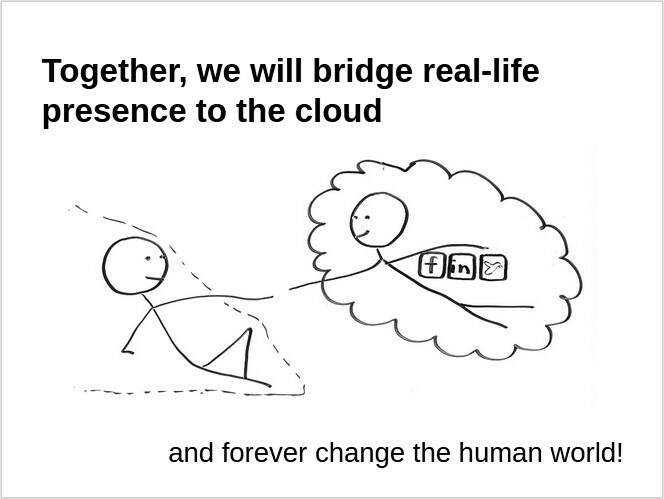 The drawing, nonetheless, was the best way we could, in 2012, represent the why without words. We were definitely wrong on the presentation: you’d never stand up in front of hundreds of people on demo day with this painfully monochromatic hack of a slide projected behind you. However, our experience has repeatedly shown that the image is both polarising and attention-grabbing. We touched something, be it privacy concerns, self-perception (a mix of physical and digital) or simply a critique of the artwork. As time goes on, our role as humans amidst the Internet of Things becomes increasingly uncertain, making those concerns increasingly relevant and preoccupying. Why shouldn’t the fully-connected world have its own Sistine Chapel ceiling for each of us to observe, contemplate and question? 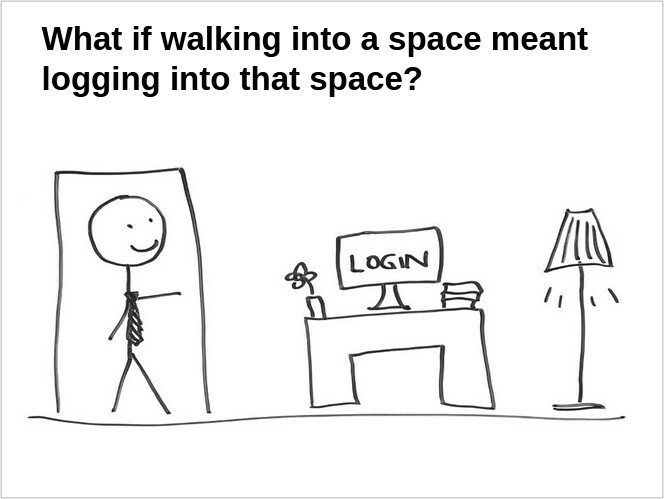 Log in to a space? 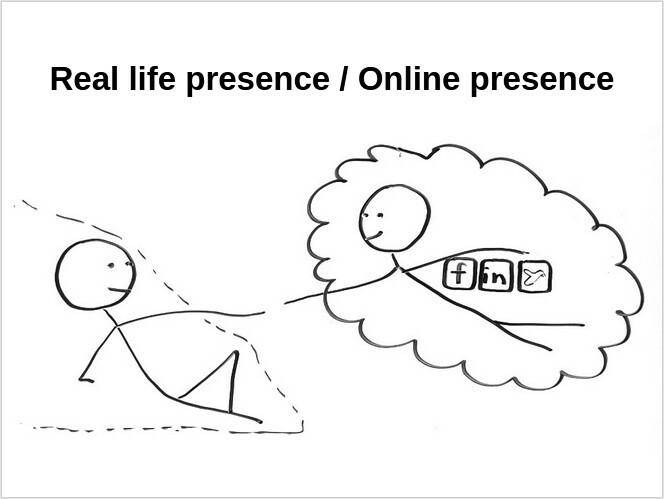 This is the slide that most people remembered from our pitch. Even months later, other members of our accelerator cohort would bring up how this slide in particular struck them and sparked the thought “wait, what if walking into work and logging in to work were the same”? We were decidedly un-wrong on the theme (yay! 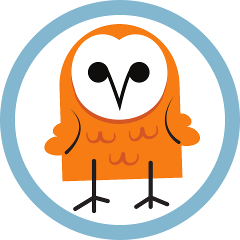 ), but indeed wrong, again, on the branding: a year later we launched Log in to Life which made the concept a reality, but failed to stir the same excitement. In retrospect, the term “log in” should be utterly avoided in the branding of any experience. Today, instead, we talk about Smart Space Experiences and shot a video to bring the vision to life. Are we wrong again? Almost certainly. How wrong? Both time and our audiences will soon tell. Look, a slide with some colour! Here we asked our audience to take a leap of faith with us. 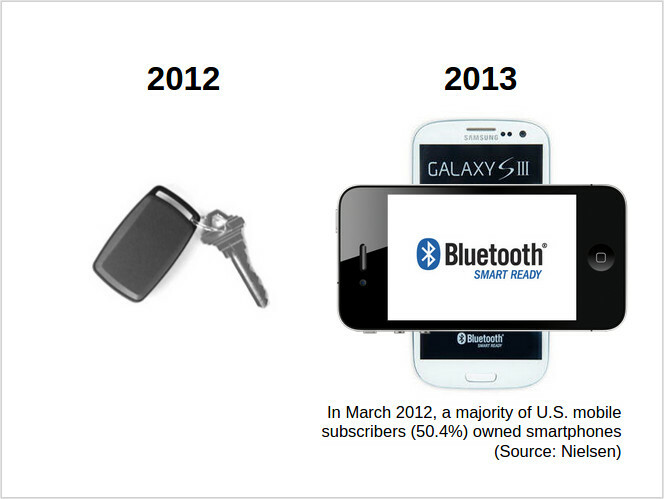 In 2012, we achieved “proximity identification” with our proprietary keyfob tags (Active RFID). But we knew that Bluetooth Smart (aka BLE) would slowly make its way into smartphones and other gadgets that people were likely to carry. In other words, we had to convince our supporters that the totally painful, non-scalable proposition of asking people to carry our keyfobs would soon evolve into our platform identifying the occupants of a space “for free”. We were definitely wrong on the timeline. 2013? Ha! Apple wouldn’t unveil iBeacon until the Fall of that year (which we totally capitalised on). Nonetheless, we were very un-wrong in our prediction: there are currently 3 billion Bluetooth devices shipping annually, and in many cases our Smart Spaces are actually doubly-detecting their occupants via their smartphone AND their wearable. That’s the kind of problem we could only have dreamed of having three years ago! You learn quite quickly that when investors ask you “who is your target market”, your answer should not be “everyone”. However, that’s effectively what we went with in this slide. So how wrong were we there? Well, over the last three years, we have indeed deployed our platform in businesses, homes and vehicles. Our best sales channels are through systems integrators who co-innovate with us and develop on our platform often as both clients and partners. And every human carrying a Bluetooth Smart device is typically already a participant, and occasionally a user (through opt-in). Moreover, the groundwork is laid for those users to revenue-share with us, so perhaps we were wrong about labelling them as customers. In fact, we’d be very pleased if that was the only part that we really got wrong. How about the multi-billion dollar market? Boy were we wrong about that! Just after our demo day, Cisco pivoted to become “The Internet of Everything” and suddenly both they and GE were floating around market opportunity values in the tens of trillions of dollars! Were their predictions wrong too? Surely! They’ve actually raised those predictions since! Yes, looking back, our first formal pitch on FounderFuel day one was indeed a vision pitch. We were certainly wrong about a lot of things, as is to be expected. But were we wrong to dream about changing the human world? Were we wrong to accord so much emphasis to our vision? The curious thing about our relentless evangelisation is that it has actually fostered many deep, meaningful human relations with our partners, clients, supporters and audience. In other words, we at least made a small impact on our human world by sharing our own dreams about that world. And with that, we have the courage to press on, continuing to knowingly be wrong, hopefully again underestimating the size of the societal transformation that is upon us.